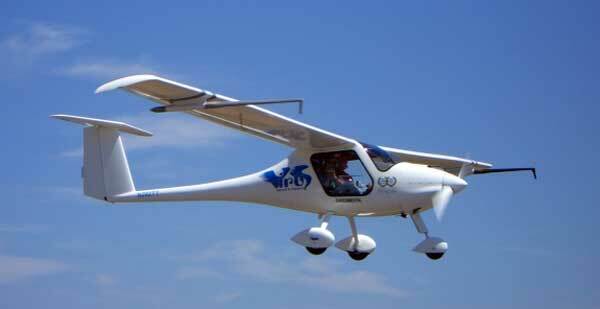 Pipistrel takes GOLD and the $160,000 prize purse at the CAFE Challenge in the USA !! The CAFE Foundation’s Inaugural NASA PAV Centennial Challenge concluded on August 11 in Santa Rosa, California, and brought forth remarkable performances by several Personal Air Vehicles (PAVs). This great event was made possible by support from NASA and Boeing Phantom Works. Winning teams shared cash prizes from NASA totaling $250,000. 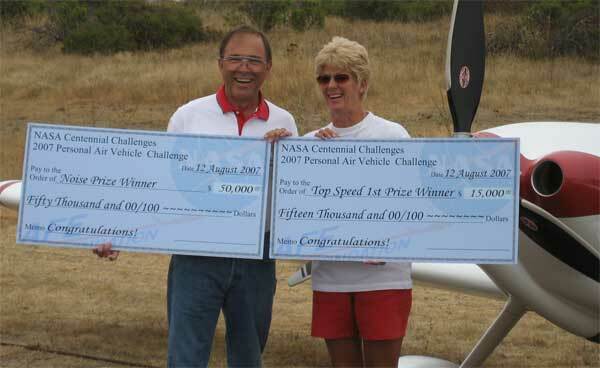 Prizes were awarded for Shortest Runway, Lowest Noise, Highest Top Speed, Best Handling Qualities, and Most Efficient, with the grand Vantage Prize of $100,000 going to the best combination of performance overall. The first of five annual competitions, this launched NASA’s vision for a new age of environmentally-friendly personal air travel. 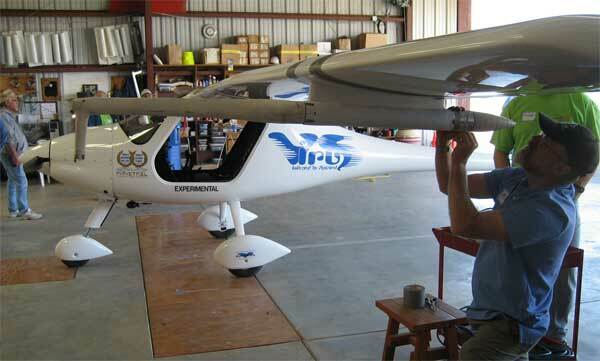 Vance Turner’s Pipistrel Virus flown by Michael Coates of Australia won $160,000 by demonstrating the best MPG (29.8), shortest takeoff distance (736 feet over a 50 foot obstacle), 2nd best top speed (162 mph – 140 knots) and most overall points. The impressive debut of the Virus, a high-tech, carbon fiber Experimental Exhibition aircraft produced in Slovenia will likely move it to the lead among the next generation of low cost aircraft. Displaying the prize booty on the Sunday media day, 5 prizes and $160,000 in cheques. 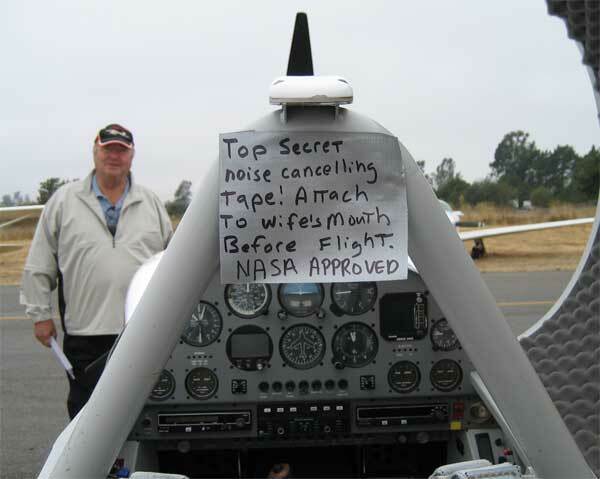 David and Dianne Anders, winners of the $50,000 Noise Prize in a highly-modified RV-4, achieved a noise level 3 times quieter than most small aircraft. That this astonishing feat was accomplished while also flying 192 mph is truly a significant advance in reducing noise. A special, low-noise Whirlwind composite propeller combined with an Ultramet Ceramic Foam muffler were key components of the noise reduction modifications on this RV-4. teasing from the other teams, here is the new NASA Approved Tape we wanted Dianne to try out !! Notice Pipistrel’s Vance Turner in the background trying to look innocent !! 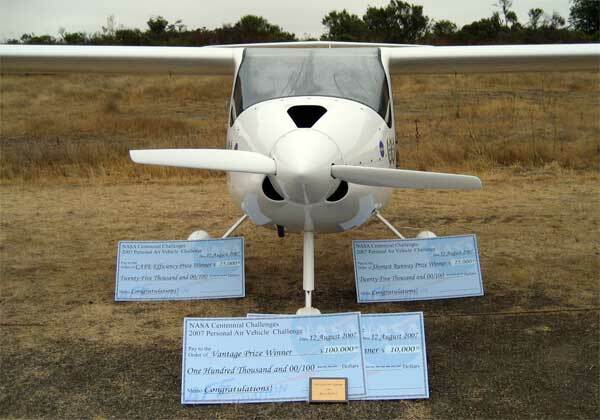 The $25,000 Handling Qualities Prize was fittingly won by the most popular of all personal aircraft, the Cessna 172 Skyhawk. 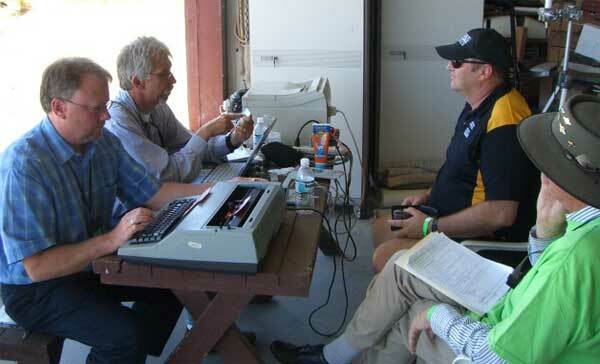 The event was well-attended by the press and public, who enjoyed the PAV Technology Pavilion hosted by EAA Chapter 124. The Pavilion exhibited hands-on demonstrations of several of the key enabling technologies for PAVs, including NASA’s fly-by-wire intelligent flight deck, synthetic vision, and the exciting new bio-fueled aircraft engines from GSE. 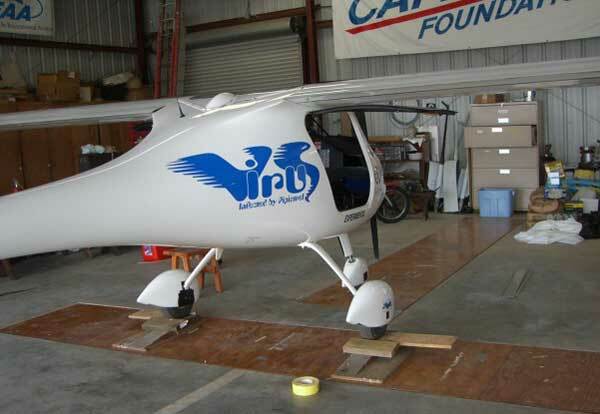 CAFE’s new telemetry system, including its ingenius “BlueBox” and ÜberBarograph, collected and streamed highly accurate flight data to the CAFE Flight Test Center. 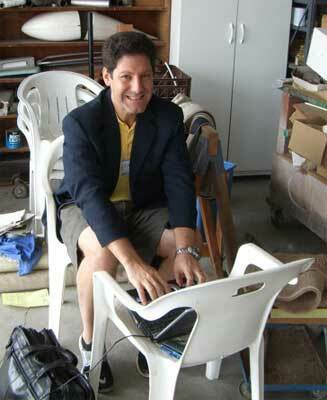 CAFE’s computerized, traceable sound measurement system established a new standard for measuring PAV noise. The gala Awards Banquet provided a joyous conclusion to the week-long flight competition, and was highlighted by NASA’s Mark Moore delivering a compelling keynote address on the Future of PAVs.